The well-known passage John 18:28-40 gives the account of Jesus’ trial before Pilate the Roman Governor. The Jewish ruling council had hauled Jesus before Pilate in order to secure the death sentence. They claimed that Jesus had declared himself a political King in opposition to Caesar and was thus guilty of treason. Of course, Pilate realised that the real reason the Sanhedrin were so bent on execution was because Jesus had declared himself to be the Son of God and that, in their opinion, was blasphemy of the highest order. Look closely at what Jesus said. Allow me to paraphrase; “I came from the realm of heaven into this worldly realm and was born into humanity to bear witness, to testify, to the truth.” From the way the other Gospels phrase this passage it is unlikely that Jesus was denying that he was a king of sorts but he was certainly making it clear to Pilate that he had another reason for being born – to testify to the truth. Again paraphrasing very freely; “You call me a king because that is the only way you can conceive of me but I am so much more than your idea of a king; I am the creator, I am life, I am the truth.” You see, Jesus did not stop with the declaration that he had come to witness to the truth, he went on to say; “Everyone who is of the truth listens to My voice.” (Holman Christian Standard Bible) Truth was on trial and Truth was staring Pilate in the eyes. In my next post I want to explore what I believe Jesus meant when he said that he had come to testify to the truth. Truth is The Word – Restoring a Lost Focus has recently been revised and published in e-book format. 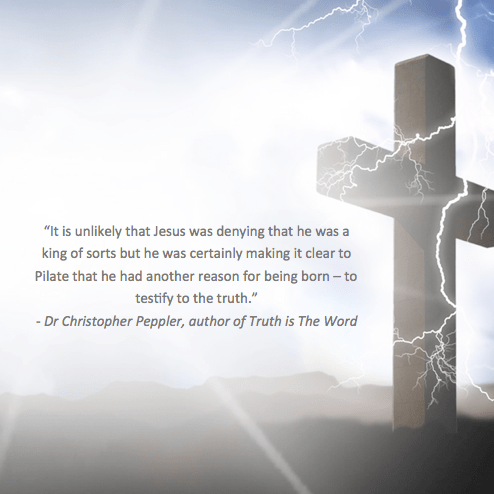 Find out more from the author on Jesus, truth and biblical interpretation in this revised edition!